Poverty is a risk factor when it comes to extreme weather. Texas Army National Guardsmen help Houston residents affected by Hurricane Harvey, Aug. 27, 2017. Hurricanes don’t care if you’re rich, poor, white or black — but that doesn’t mean that every person is equally vulnerable to a storm. Low-income families are more likely to live in flood-prone areas with deficient infrastructure. Hurricane Harvey is yet another example of this pattern. While large parts of Houston flooded, low-income neighborhoods fared worse than wealthier areas. “[Houston] is a southern city. Generally, the way that the city has grown and the way that the housing and residential patterns have emerged have often been along race and class lines,” Bullard said. Discriminatory housing policies have “restricted or, in some cases, confined poor people and people of color to less desirable areas when it comes to flooding and other kinds of land uses,” he said. In Houston, these tend to be communities of color. A history of red-lining and economic inequality have conspired to make it one of the most racially segregated cities in the country. On this map, each person in Houston is represented by a single dot smaller than a pixel. Each dot is colored according to the race of that person. Data come from the 2010 US Census. White people tend to live on the west side of the city, while black and hispanic people tend to live on the east side. The map below shows the distribution of floods across the greater Houston area. 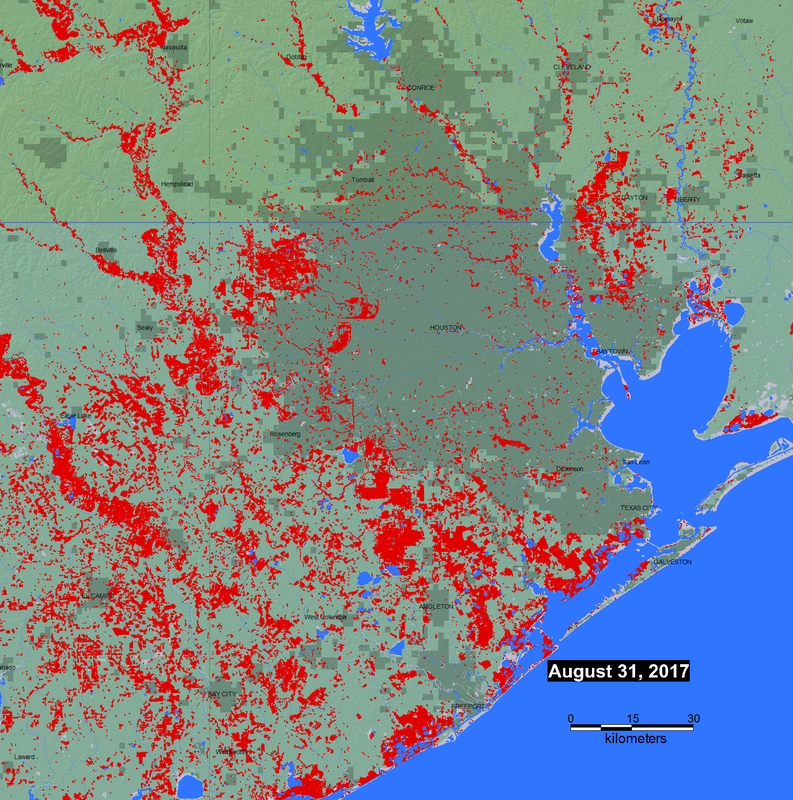 The red spots represent the maximum observed flooding during Harvey, as shown in this map from the Dartmouth Flood Observatory. Notably, flood data are incomplete in heavily wooded or urban areas. Trees and buildings obscure the view of satellites recording the extent of floods. So, in central Houston, the flooding is likely much worse than the map suggests. The flood data have been overlaid on a map illustrating social vulnerabilityby census tract. People are more vulnerable to natural disasters if they are poor, elderly, disabled, don’t own a car or can’t speak English. The Social Vulnerability Index, developed by the Centers for Disease Control and Prevention, accounts for these variables and more. Red areas represent the maximum observed flooding during Hurricane Harvey. Each shaded section of the map represents a census tract, colored according to its relative vulnerability. Darker areas are more vulnerable. These disparities will only become more exaggerated when the storm is over. In the eight counties hardest hit by Hurricane Harvey, less than one in five homeowners have flood insurance, according to analysis from the Washington Post. The National Flood Insurance Program, which provides insurance to homeowners in high-risk areas, has not kept pace with climate change. It has underestimated the risk of flooding in many areas. Many low-income families without flood insurance will struggle to rebuild their homes. If that sounds bad, it gets worse. The city’s poorest residents are also more likely to live near oil refineries and petrochemical plants. This map from the Union of Concerned Scientists shows that accident-prone facilities are concentrated on the east side of the city, in communities of color. Harvey delivered floods that cut off power to chemical facilities in these areas, shutting down cooling systems. Several chemical containers overheated and caught fire. The red dots represent serious accidents at industrial facilities in Houston between 2012 and 2016. Accidents tend to cluster around low-income communities on the east side of the city. “When it comes to the elevated and disproportionate risk, it is immoral, unethical and probably illegal if you’re talking about tax dollars being used in way that is discriminatory in effect,” Bullard said. The problem is not unique to Houston or New Orleans, which saw similar inequity in the wake of Hurricane Katrina.